Torta Arancia alla Mandorle, originally uploaded by Lameen. Bake on 180C for about 20-25 minutes depending on your oven. 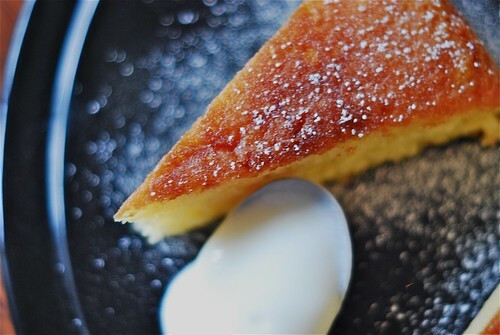 Whilst your cake is baking make your orange glaze by pouring 50ml of freshly squeezed orange juice, 30g/2 dessert spoons of caster sugar and 50ml/2 tablespoons of water and cook on medium heat until all the sugar has dissolved and the mixture looks syrupy - about 5 minutes. As soon as your cake is done, take it out and poke it with a barbecue stick or with a thin sharp knife. Then pour the orange syrup all over the cake, whilst it is still in the baking tin. Don't panic if you see all the liquid on top of the cake, because in about 4 minutes it will all be gone, making your cake extremely moist, YUM ! I call this cake.... TORTA ARANCIA ALLA MANDORLE. 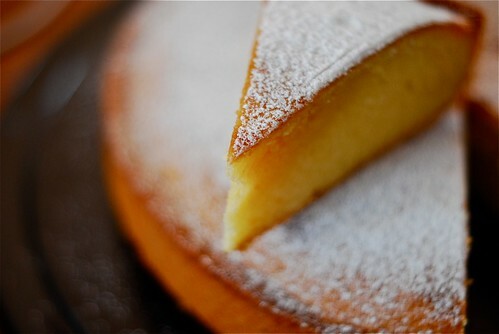 In English, Almond and Orange Cake. Why ? Because it reminds me of a typical Italian moist cake that I've seen or heard of in some Italian cookbooks and oranges and almonds are so Italian. Because this cake will be a bit sweet with the syrup, I suggest you serve it with something sour like natural yoghurt or just whipped cream. ENJOY ! Recipe Inspired by my taste buds. (ii) Always bake the base first - Why ? When you pour your "wet" cheesecake mixture on top of the biscuit base, you don't want it to soak into the base, but a baked and slight hard biscuit base will be easier to resist the wet mixture. I got this tip from Williams Sonoma's Baking. so, in summary bake the base for about 10 minutes on 180C. For a 20" springform, you will need 150g of biscuits with 80g of butter and one dessert spoon of caster sugar. For the larger 24", you will need 250g of biscuits (a standard pack) and 150g of unsalted butter, together with 2 dessert spoons of caster sugar. (iii) Don't forget the science of mixing warm and cold stuff together. Here, I mean "cold" cream cheese with "warm" sugar. You should always take the eggs out so that they are at room temperature - say about 1 hour before in the summer and 2 hours before or so if in the winter. 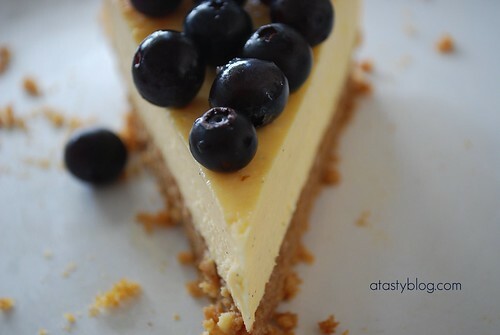 If you mix really cold stuff together with warm stuff it will create bubbles and sometimes we see this in cheesecake when it is baking, it puffs up in one corner and you think why ? This is the main reason. If you forget to take the eggs out on time, just make your mixture but leave it to sit out for about 30 minutes whilst you make and cool the base. (iv) Finally, use a water bath. I know this sound like hard work and to be honest when I was experimenting on getting that perfect recipe, I omitted it for a few years until one day I tried it and the results where amazing both in taste and look and I've never looked back. 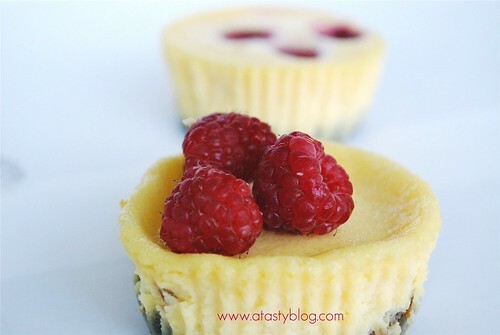 The rationale -using a water bath makes the temperature even out during the baking process, makes the cheesecake more evenly cooked and gives it an almost melt in your mouth texture and finally your cheesecake won't look burnt on the top - it will look like the ones you see in cookbooks/ fancy cake shops with perfect yellow tops. OK ! What next ? The recipes of course, of which there are many but as a standard I'm going to list what works for me. a combination of 600g of cream cheese (Krafts Philadelphia is the most famous), sour cream, creme fraiche, mascarpone, sifted ricotta, with stronger bias on the cheese. So for example, you can use 250g cream cheese, 250g mascarpone and 100g whipped cream or 100g creme fraiche, just make sure everything adds up to 600g. Use the tips above about baking the base, water bath, etc. and then place the tin into a baking pan and the pour the boiling hot water around the edges. Now place into a 170C oven and bake for about 30 minutes, after which start checking that the top is firm. You can check this by giving the pan (using oven gloves) a little nodge and if the top wobbles, then it isn't ready, but don't go far away because it could all be ready in 5 minutes. If the cheesecake rises, which might happen if you use more cream cheese than 500g, don't panic, it will fall down later. When it is ready, the sides should begin to give like this. Contrary to other chefs, as so as the cheesecake is ready I take it out of the oven and not leave it in the oven for another 1-2 hours to cool - I want this to be practical, right ? Place you cheesecake on a wire rack to cool for about 2 to 3 hours or more, after which place in the fridge over night or for about 12 hours (for early birds). Don't panic, you can smooth it out by wetting a palette knife and going around the edges. Serve the cheesecake after it has been out of the fridge for at least 30 minutes and slice with a hot dry knife - run the knife under very hot water and dry it. It will make it easy to slice that creamy heaven. Before I forget... for the pic on top of the post, you can impress your friends by grating dark chocolate on top before you serve. If you want to cover the top with a sour cream topping, then mix together 250ml of sour cream with 2 dessert spoons of caster sugar and one teaspoon of vanilla extract and pour on top of the still baking cheesecake about 10 minutes before the end - but be careful that the cheesecake is almost done, so that the sour cream doesn't fall through. I promise to share some actual recipes with you very soon God willing. Let me know how you get on as the nights are getting longer, the temperature is getting colder, so a good time to bake and share with friends. I'm moving house now but wanted to get this out to you so forgive me for any grammatical mistakes, bye and wish us luck. So what's maximum taste ? In short it's my concept or philosophy on baking and getting the best from baked cakes, whereby every bite is the same - you get the maximum benefit - sounds a bit a a real philosophy or economics concept ? It isn't so let me break it down from a tasty perspective. Everything starts from somewhere and for cakes it started with mixing butter, sugar, eggs and flour, and voila, cake. It goes back to childhood memories of waiting for your mum (or in my case, when my kids grow up, Dad !) to finish emptying the cake mixture into the cake tin and giving you the bowl to lick out. I'm sure you've been there - licking that mixture of sugar, butter and flour with a combination of eggs and vanilla extract or flavoring. OK ! Come back to earth. You can actually experience "maximum taste" in a well baked classic "pound cake" or sponge or Madeira cake - cakes just made with a combination of butter, eggs, flour and of course sugar. It follows on from the common thread "the best things in life are the simple things". So in short, by maximum taste I mean eating something, where every bite is the same, resembling the same experience that you just want to eat more and more of it, but you have to build in control, if not you're not going to see your feet in a few years time. For me, the cakes have to be moist, so I always modify a recipe so that it is more moist and therefore brings out the sweetness, after all "if it looks great and doesn't taste great, then why bother?" I bake and cook because I want to eat and enjoy what I'm eating, not to show off or to win competitions. In fact I actually toyed with the idea of calling my website "maximum taste" but the marketing and funny part of me thought "what would that exactly stand for... Lameen ?" and so I came up with atastyblog. So what are we baking here ? Almond and Lemon Cake... right. OK ! my philosophy on "maximum taste" is captured in what I think is this wonderfully delicious and simple cake. If I had to make only 3 cakes, this would be on the list, along with Gateau Breton and my classic London Cheesecake (recipe not shared with you yet - more on that very soon God willing. So let's get to baking one of my favourites. Please put the oven on at the beginning on about 180C so that it is ready, about 10 minutes on my old one, before you bake the cake. As this is just a classic, place the butter and sugar into a wide bowl and mix it until creamy, then adding one egg at a time, mixed in with about 2 tablespoons of the flour, continue mixing until everything is incorporated and you have one smooth buttery batter - keep your fingers out. Then place the ground almonds inside the bowl and mix gently, followed by the zest (I hope you have a citrus zester - see below), lemon juice and either of the extracts. The lemon juice might give the batter a curdled look, but don't worry, it will be alright at the end. Line the bottom of a 24cm spring-form round cake tin and butter the sides, then place the batter inside the cake tin and bake for about 25 minutes, checking the oven from 20 minutes, because although my oven is old and not expensive, it bakes really quickly and this is the sort of cake that should not be dry - remember the maximum taste philosophy, moist and sugary is best. Anyway alter the baking time according to your oven but just keep checking it every 5 minutes - it's worth the hassle trust me. TASTY TIP: As this cake is buttery and butter and sugar burn quickly giving cakes like this, a burnt top, place the cake not on the top nor the middle of the oven, but closer to the bottom for at least 80% of the baking time. You should then get a light brown top. The cake is ready when your cake tester comes out dampish but the top is firm. Leave it in the cake tin for about 10 minutes on a wire rack to cool and then unmould and place back onto the wire rack. This is so delicious slightly warm, so if you cannot help yourself, cut into after about 30 minutes. I don't recommend earlier, unless you want the cake to scorch your fingers and you like your cake crumbly. - is that fair ? One half for daddy and the other half for mummy + 2 kids... hmmm ! I never thought about that, but in any case after a few slices, Daddy/Hubby's territory is no more. The romantic combination of tangy lemon, with sugar, complimented with the almonds is sensational. I usually have to employ full control when I make this, restricting myself to just one slice a day. This really is finger licking good for me. It goes really well with black coffee (espresso or filter) Despite my bias on sugar with this cake, this cake is just right - it isn't too sweet but the key is the moistness, the lemon juice cuts through the sugar, so delight yourself. Try it and let me know what you think. Based on a recipe in Nigella Lawson's "how to be a domestic goddess", but with many modifications to suit my taste buds but of course. 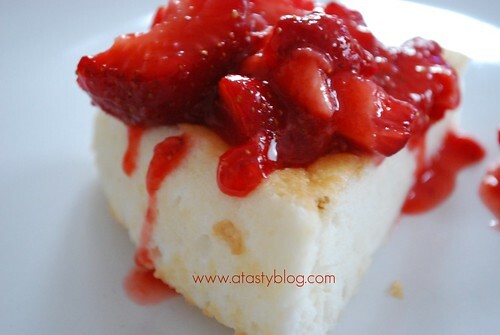 Angel Cake Avec Fraise, originally uploaded by Lameen. Whip 5 cold egg whites with 1/2 teaspoon of cream of tartar and a pinch of salt until you get soft peaks. Stop and add slowly 200g of caster sugar (confectioners/granulated sugar if in the US) and continue whipping the egg white and sugar mixture until it becomes very shiny, glistening more like, so that you now have stiff peaks. Now add one teaspoon each of vanilla extract and almond extract. After this, add slowly about 70g of plain flour until the mixture is now soft and fluffy. Pour very gently into an ungreased springform pan. It is very important that you do not grease the pan because any contact with fat (oil, butter, etc) will make the meringue like structure collapse, which is what you do not want. Bake the cake undisturbed for about 20 minutes on 170C. If the top is brown and looks firm, check it with a cake tester in the middle of the cake and if your cake tester comes out dry it is done. Let the cake cool for about 1 hour in the pan, preferably upside down, so that it aerates and rises. you will need to let the cake out gently using a thin knife - if you have a non-stick pan please use a plastic non-scratch spatula. As the cake isn't overtly sweet, I recommed serving it with crushed strawberries. Per portion, use about 4 large strawberries and crush using the back of a fork with 1 teaspoon of caster sugar so that you have some strawberry juice. I'm always looking to try something new and when I saw this recipe in Bill Granger's new cookbook "Feed Me Now ", I thought great something new and interesting to try, especially with the crunchy topping. However, I must confess when I saw the picture in bill's book and the recipe, I thought there's no way if I bake this, it's going to have that lovely brown colour. So flicking through another one of my 100 foodie magazines, I saw a banana and chocolate cake and thought "Aha ! that's the way to get that colour". However, on this occasion, I thought "I won't look at that recipe, I'll just modify Bill's, so that it looks like what I want it to look like - a bit fussy, but food has to look and taste good too. So, let's dive into this cake recipe, which I call "Banana and Chocolate Cake With a Crunchy Almond Topping". First up, crush 30g blanched almonds in a mortar with a pestle if you have one, and then mix it with about 45g of soft brown sugar and set aside. Next up, mix 200ml sour cream with 1 teaspoon of bicarbonate soda and set aside for about 5 minutes. During this time, sift 200g of plain flour, 25g unrefined cocoa powder, 1 teaspoon each of baking powder and ground cinnamon into a bowl and set aside. Then mash two very ripe bananas. After this, mix in 100g of melted unsalted butter, 200g of caster sugar, 2 large organic eggs into the sour cream mixture, followed by the dry ingredients. Mix it well until there are no streaks and then fold in the mashed bananas and 1 teaspoon of vanilla extract. Pour the mixture into a 10 by 5 inch loaf tin and then sprinkle the almond sugar mixture on top - it should sit on top and not sink to the bottom. Bake for about 45 minutes, until a cake tester comes out cleanish - cool in the tin for about 15 minutes and then on a wire rack. If you want to eat this hot, serve it after about 15 minutes cooling time with some vanilla ice cream. I just love this picture above and I even gave it a name "Escaping Almond Crunch..." The creme de la creme (my wife's words) of this recipe was definitely the crunchy almond topping. It was something I'd never thought of before but it gave the whole cake a different concept. My added touch of cocoa powder to give it that chocolate feeling also went down well with friends and colleagues and really compliments a cup of good coffee. So, if you're up for it and have some very ripe bananas and of course some sour cream in the fridge, try this out, yum, yum. This is like part two of my previous post as I shared my chocolate icing recipe with you, so naturally I've got to share a chocolate sponge cake recipe with for you, so that you can put that lovely icing all over it. For this again, I go back to Nigella Lawson's Buttermilk Birthday Cake recipe in "how to be a domestic goddess" but of course with a few touches added by moi. The first one of course is that mine is strictly speaking a "chocolate version" or should we say "chocolate buttermilk sandwich sponge cake", which I've done a few times for children's birthday cakes. I also add corn flour because it makes the cake kind of spongy. I usually make this cake using my food processor, but you can use a food mixer or make by hand of course, just follow this process. Before you start, line your sandwich tins with baking paper/parchment and put the oven on 180C. First up, sift the flour, baking powder, bicarbonate of soda, corn flour and cocoa powder into a bowl and set aside. Secondly, pour the buttermilk into a jug and stir in the vanilla extract and leave for about 5 minutes, whilst you get on with the rest of the preparation. You want the sour buttermilk to infuse with the vanilla extract. Next, cream the butter with the sugar and then add one egg at a time as you add about 1 tablespoon of the flour mixture. Keep doing this until all the eggs are incorporated. Once this is finished, add the remaining flour mixture and slowly pour in the buttermilk mixture until everything is incorporated. Now, pour the mixture equally between the two sandwich tins, place into the middle part of the oven for about 20-25 minutes until a cake tester or toothpick inserted into the middle comes out cleanish - you don't want it too dry - moist cakes are king. Let the cake cool in their tins for about 10 minutes and then unmould and let the cake cool down. I usually do this in the night and then ice the cake in the morning. Ok ! so now you are ready to ice the cake and for that see my last post. However, as this is a sandwich cake you need something in the middle. For this, take two spoons of the chocolate icing and mix it with two tablespoons of mascarpone cheese - now you have the bit that goes in the middle. Put one cake down face up, spread the mascarpone chocolate mixture on top and then place the other cake on top and spoon over your icing carefully, spreading it like butter. This cake was a real hit with both friends and the family alike and I've already made it twice in 8 days - it's that easy. Recipe has been adapted from Nigella Lawson's "How to be a Domestic Goddess"
I'm not sure about you, but I don't like throwing food away, so sometimes what I bake on the weekend is determined by what's in the kitchen or the fridge, which of course will go off if it isn't used immediately by me. So the other Sunday I was wondering what sort of cake to make, looked at some very ripe bananas - the one's with lots of freckles on them - and thought "that's it, I'll make banana and walnut cake". I really like this recipe, which I found in Nigella Lawson's "How to be a domestic Goddess" and which after countless banana cake recipes, I found is just the right one for me and of course for those that I share my cakes with - family and friends. Before delving into the recipe, there's always a history with portraits and you will be surprised to know that although I've always liked bananas in desserts - my favourite at one time was banoffee pie - I never could eat fresh bananas, that was until my wife was pregnant with our first child. Now, isn't that odd ? So eating bananas has a kind of strange history for me and with this cake, eating the baked version together with the fresh one provides a unique tasty experience. The most important ingredient of course, is very ripe bananas, of which two will do. I've slightly adjusted the recipe and call mine cake and not banana bread like Nigella. Just peel them and mash them in a bowl very fiercely with a fork until they look like a real mess. Next get the dry ingredients ready, 175g of plain flour, 2 teaspoons of baking powder, 1 teaspoon of bicarbonate of soda, half a teaspoon of salt and set aside. Then mix 125g of melted unsalted butter with about 150g of caster sugar until no streaks appear, after which beat in the eggs one at a time, only if they are not at room temperature, if not, just mix in both the eggs at once until well blended, followed by the mashed bananas and one teaspoon of vanilla extract. Almost there - if you are adding walnuts, mix about a handful of crushed walnuts, after which gradually mix in the plain flour, one spoon at a time so you don't affect the balance and the air of the cake. If you want to make this more fruity, add about 50g of raisins too. Now, put into a greased or baking paper lined loaf tin and bake for about 20-30 minutes until your baking stick or a long toothpick comes out cleanish but not completely dry as this should be a moist cake. That was quick and not so difficult, so if you've got some ripe bananas and some friends coming over for tea, this is the cake for you as it can be prepared and baked in under 40 minutes and they are sure to go Hmmmm ! You can even impress them further by serving it with slices of fresh banana round the edges and say "for today's cake, I'm serving a portrait of a banana cake" - wait for them to laugh or say "Oh la la, I'm first...."